Middle Park West, as viewed to the southwest from Union Drive West. 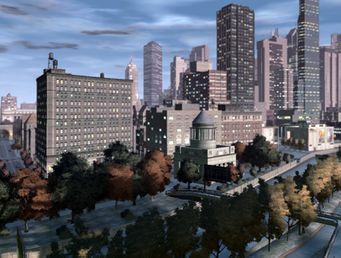 Middle Park West is a neighborhood in western Algonquin, Liberty City in Grand Theft Auto IV. It is bordered to the north by Quartz Street (Varsity Heights); to the east by Frankfort Avenue (Middle Park); to the south by Nickel Street (Purgatory); and to the west by the West River. Middle Park West is an affluent, heavily-developed neighborhood, bearing more in common with central Algonquin neighborhoods than those along the western Algonquin coast. The area features several townhouses and upscale high-rise apartments, much like Middle Park East on the other side of the park; however, much as with the inspirational neighborhoods in real life, residents in Middle Park West tend to be younger artists and cultural workers, whereas those in Middle Park East are older businessmen and women. This is reflected with the presence of a museum and performing arts center in Middle Park West. The eastern border of the neighborhood features its towering, modern, luxury high-rises. Its central area is dominated by townhouses and also is the commercial center, whereas the part of the neighborhood along Ivy Drive South features its more historic upscale apartments. West of Ivy Drive South to the West River, Middle Park West is dominated by a public park, which is based on Riverside Park. A Banshee can be found over the road from The Randolf Art Center in Middle Park West, which is on the wanted list for the Car Thefts. Middle Park West is noted for its ease of access to public parks, along with adjacent neighborhood Varsity Heights, albeit to a slightly lesser extent. As already prior mentioned (and as reflected in the name), Middle Park West's main attraction is the namesake park which it lies adjacent to. Middle Park spans the entire length of the area (as well as neighboring Varsity Heights to the north) on its Frankfort Avenue border. In addition to Middle Park, there is the aforementioned second park lying on the area's western corridor, fronting the West River. Union Drive West bisects the park; the main area, featuring a promenade along the river, lies to the west and spans from Nickel Street to about Silicon Street (which terminates at Ivy Drive South). The secondary area of the park occupies a narrow parcel of land between Union Drive West and Ivy Drive South; in it lies a replica of Grant's Tomb. The two halves of the park are connected by a pedestrian overpass which is located at about Pyrite Street (which also terminates at Ivy Drive South). The Liberty State Natural History Museum. Located elsewhere in the neighborhood is the Randolf Art Center, based on the Lincoln Center for the Performing Arts, at the intersection of Galveston Avenue and Obsidian Street; it is the center for performing arts in the city and is located across the street from a performing arts school in neighboring Purgatory. The Liberty State Natural History Museum, which building is based on that of the American Museum of Natural History, is located on Frankfort Avenue between Pyrite and Quartz Streets. 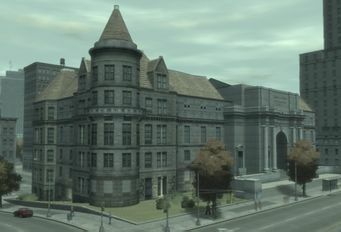 Bernie Crane's apartment, which Niko Bellic locates in Weekend at Florian's, is situated at Ivy Drive South, across the road from the block housing the Grant's Tomb replica. Other replicas of real-life landmarks in New York City within the district include a scaled down version of The Dakota and the Trump International Hotel and Tower (depicted in game as Mammon Heights), complete with a similarly designed globe sculpture at the rear plaza. Both buildings are located along Frankfort Avenue, the Dakota replica at Frankfort and Quartz Street and Mammon Heights at Frankfort and Nickel Street. Middle Park West is based on the Upper West Side, an upscale residential/commercial area in Manhattan. The Liberty City Subway serves Middle Park West at two stops. At the intersection of Obsidian Street and Frankfort Avenue is West Park; it is one of three stations directly serving Middle Park, the others being North Park and East Park. It is served at all times by the K/C Algonquin Inner Line. Quartz West is located at the intersection of Quartz Street and Ivy Drive South, at the neighborhood's border with Varsity Heights. Like West Park, this stop is also very popular with parkgoers as it offers very convenient access to the waterfront park, situated just across the street. The stop also lies on the campus of the university in neighboring Varsity Heights. The station is served at all times by the Algonquin Outer Line. The Middle Park West skyline to the east, fronting Middle Park. This page was last modified on 23 August 2012, at 22:18.